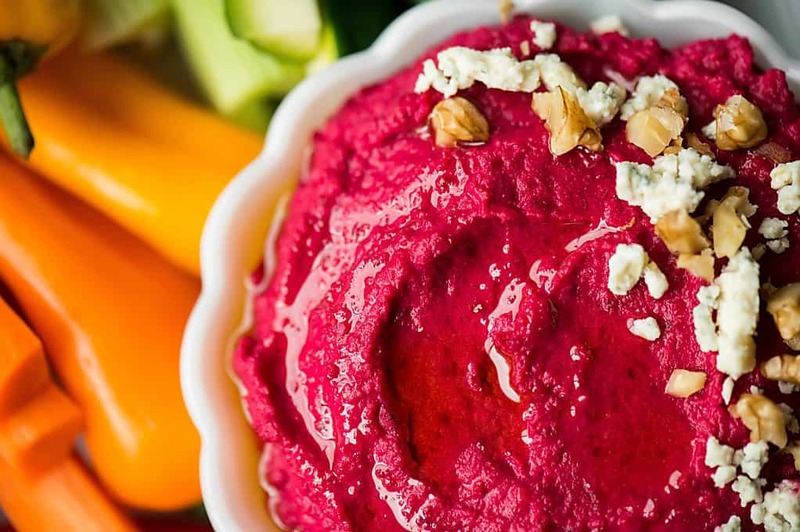 If you’re looking for a vibrant, healthy, and tasty appetizer that’s easy to make, look no further than this Roasted Garlic Beet Hummus. 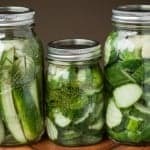 I wanted to create a tasty and healthy dip to accompany them. Enter: HUMMUS. I took my original hummus recipe and modified it a wee bit. 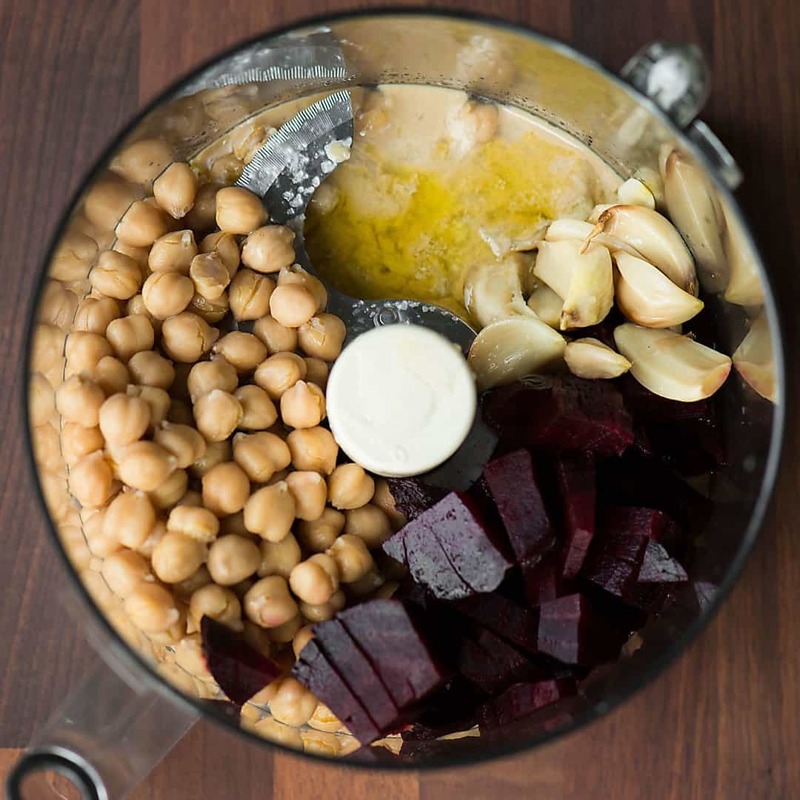 The general concept is the same – chickpeas + tahini + garlic + lemon juice + olive oil get whirled around in a food processor until smooth and creamy. The only difference is that instead of adding one or two cloves of raw garlic that really packs a punch, I added an entire head of roasted garlic that makes anything oh-so-good. 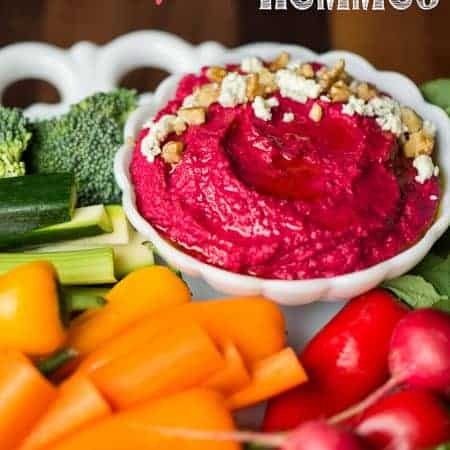 The addition of one whole roasted beet not only gave this hummus and earthy flavor that I know and love, but how can anyone resist the bright pink flavor! Isn’t it pretty? You know, with plant based food, the more color the more nutrition you get. You just can’t get more colorful than beets. When I made this hummus, it was for a group of people. I set it out with a veggie tray along with crackers and chips. Doesn’t that sound delicious? 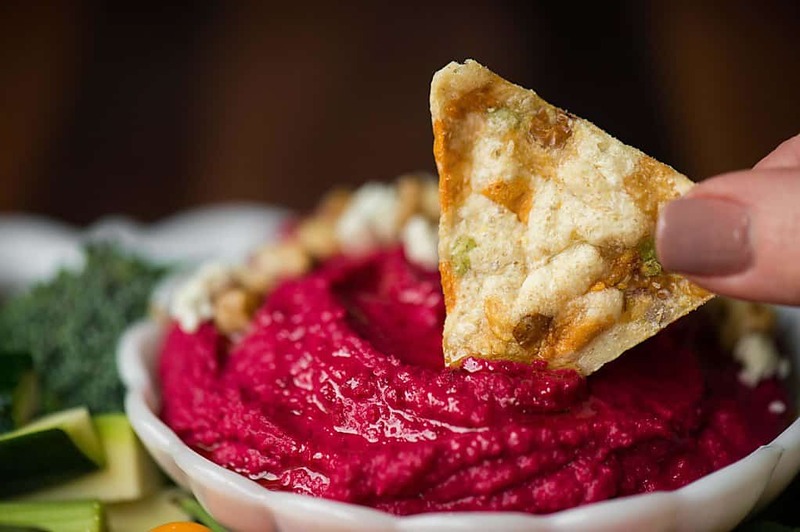 If you're looking for a vibrant, healthy, and tasty appetizer that's easy to make, look no further than this Roasted Garlic Beet Hummus. Preheat oven to 425 degrees F. Remove outer papery layers from head of garlic and leave innermost layer to keep the head of garlic whole. Remove leaves from beet, if needed. Drizzle with half of the olive oil, 2 tablespoons, and wrap loosely in aluminum foil. Roast in preheated oven until the beet is tender and the garlic starts to turn golden brown, about an hour. Remove from oven. When cool enough to handle, remove cloves from head and peel skin away from beet. 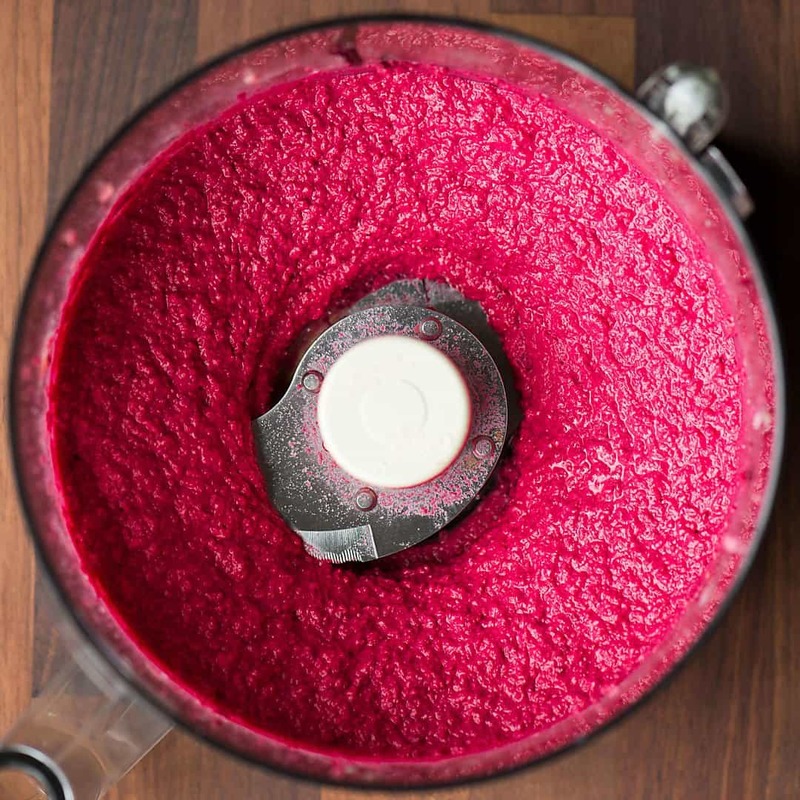 Combine roasted garlic and beet with tahini, lemon juice, remaining olive oil, chickpeas, and salt in the bowl of a food processor. Process until fine. With the food processor running, add a small stream of water until the desired consistency is reached. 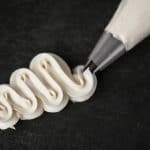 Process until smooth. Top hummus with gorgozola and walnuts, if desired. My favorite healthy snack is a baked sweet potato topped with almond butter, raisins, pecans, cinnamon and cayenne pepper…I like a bit of heat! My favorite healthy snack is apple slices with PB2! Actually, hummus is my favorite snack. It is healthy and easy to put on a cracker. My dog loves it as well. I like trying different hummus recipes. It looks yummy! I am definitely going to try this. 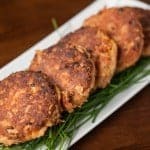 Always looking for gluten-free recipes that I can share with my sister that has Celiac. These all look so delicious!! I love carrots dipped in hummus! 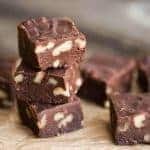 I love to have fresh fruit, cheese and nuts as a healthy snack. My favorite healthy snack would have to be fresh carrots and ranch. My favorite healthy snack is guacamole. Hummus and pita chips is definitely my go to healthy snack! One of my favorite healthy snacks is avocado toast but on grain pita. I actually love hummus or I make homemade lara bars.. I like to snack on grapes. 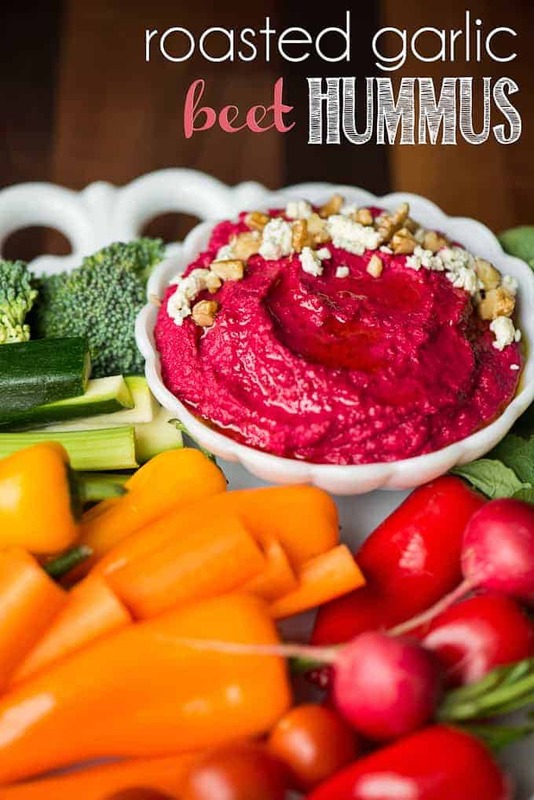 I love hummus with fresh veggies!! My fave healthy snack is sweet grapes cut in half and mixed with yogurt. My healthy snack is plain ..raw veggies….bland! I like most fruits, a nice berry melody is a great snack.